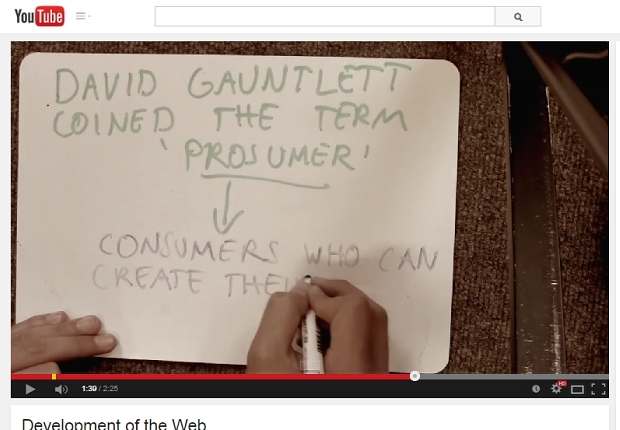 I have stumbled across one or two webpages, YouTube videos, and SlideShare decks, which tell me that David Gauntlett coined the term ‘prosumer’. I hope this post is not too self-interested and irritating but I want to point out: I have never, ever even used the word ‘prosumer’. I think this post is the very first time I have typed the letters p‑r‑o‑s‑u‑m‑e‑r in my life. I’m not cross about it or anything, honestly I’m not, but I thought it might be worth correcting that bit of misinformation in a simple blog post. And also: I do hate it when people make up stupid words for things that we already have words for. That’s why I not only did not coin the silly word, but have also ignored it and never used it. It is true that in my work, such as the books Making is Connecting, and Making Media Studies, I am very interested in people making and exchanging things in everyday life – including, but not only, digital media materials – and the transformative power of this everyday creativity. That’s all good! But you see, I just said that without using any stupid made-up words. Of course people are both writers and readers – producers and consumers, if you like, which is where ‘prosumer’ comes from – but that’s obvious and has always been the case when human beings have conversations. And in fact the ‘producer’ and ‘consumer’ terminology isn’t quite right anyway. When you’re in the listening, thinking and responding bit of a conversation, I wouldn’t call that ‘consumption’. It’s not the right word. And when you’re making and speaking, I don’t think ‘production’ is the best word either. (It’s not wrong, as such, but it sounds too much like manufacturing, which brings not-quite-right connotations). Squashing two not-quite-right words into one stupid new word is not a cunning plan. So let’s talk about all these interesting things – creativity, conversation, people making connections with each other, exchanging ideas and inspirations – but we don’t need to start using silly made-up words. Image: Screengrab from this YouTube video.